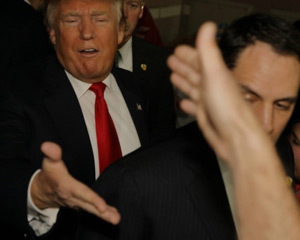 Donald Trump shakes hands with voters at the Nevada caucus on Feb. 23. Presumptive GOP presidential nominee Donald Trump is expected to clarify his energy platform in a major speech tomorrow at the Williston Basin Petroleum Conference in North Dakota. He'll adopt a similar tenor when addressing OPEC. "We have to look at the global playing field and see which of our partners — OPEC, Iran, Russia — are playing fair in the global marketplace," Trump advisor Congressman Kevin Cramer (R-ND) explained to Reuters today. Cramer suggested that Trump criticize OPEC for its role in the oil crash of November 2014 that sent crude prices plunging a whopping 40%. Many U.S. oil companies went bankrupt because of the ensuing oil glut caused by OPEC's overproduction. Trump hasn't shied away from criticizing the oil cartel in the past. On March 26, he told The New York Times that the United States should discontinue purchasing Saudi oil until the country agrees to contribute troops to help fight ISIS in Syria and Iran. Voters and investors tuning into Trump's speech tomorrow will also be looking for the specifics of his energy policies. The billionaire has previously stated that he believes global warming is "a hoax" created by "pseudoscience." On May 17, he told Reuters that he would like to renegotiate the Paris climate agreement if he becomes president. But this past Monday the media picked up on the fact that Trump does recognize climate change as a detrimental issue… at least when it comes to the upkeep of his golf resorts. Apparently, Trump is seeking permission from Clare County Council in Ireland to build a limestone seawall "to protect the golf course and dunes from excessive erosion," reported ABC News yesterday.